It’s been said that singing is twice praying, or praying twice, but either way, our goal is to make a joyful noise to the Lord. We are blessed at St. Pius X with many musicians, some professional, most not, but all dedicated to praising God through their music. We are a musical "family" formed in fellowship from the love of music and our Catholic faith. We currently offer six ensembles, each with a unique style of liturgical music. 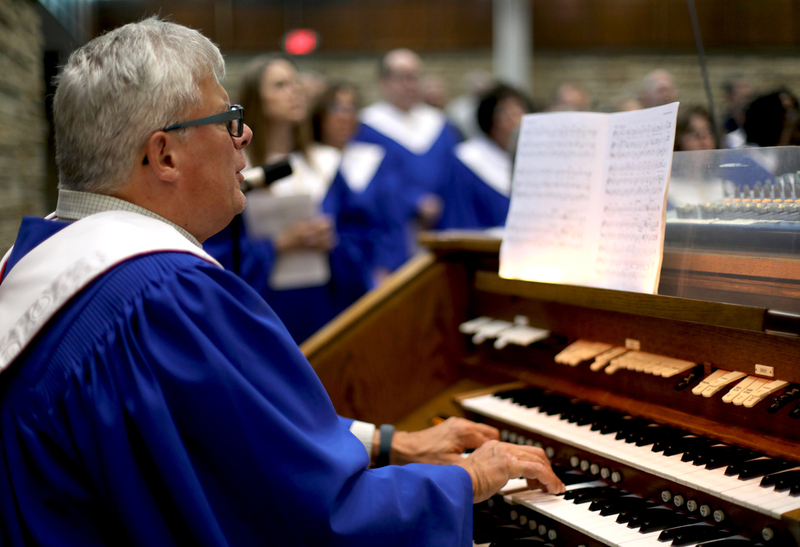 Adult Choir – This choir began with our parish in 1958. We sing a wide variety of styles from sacred to contemporary. High school age or older. Joy in the Morning – This contemporary guitar and vocal group is led by Debbie Liffick, who co-founded the ensemble in 1972. New Creation Contemporary Ensemble – This guitar and vocal group is open to singers and musicians who are high school age or older. A love of spirit-filled liturgical music infuses this group&apos;s arrangements. Merging Spirits – Our youth choir was founded to open our music ministry to those in Grades 7 and up. We feature guitar, electric guitar, percussion, and piano and sing youthful liturgical music from the Spirit and Song series by Oregon Catholic Press. Children&apos;s Choir – This choir is open to all those in Grades 1-6 who are registered in St. Pius X Parish. We sing once a month from November to May, including a Christmas Mass, and instrumentalists are welcome. Resurrection Choir – This choir gathers those who are available during the day to sing at funeral liturgies. If you are retired, this is a great choice! Being able to read music is a plus, but not a requirement. If you can sing the songs in our missalette, you are a wonderful candidate! If you&apos;re not able to make a commitment to a group, we could still use your musical talent on an occasional basis. Please contact us via phone or email to share your interest as either a singer and/or a musician. We can provide answers to your questions and help you with a flexible schedule so that you can become involved.